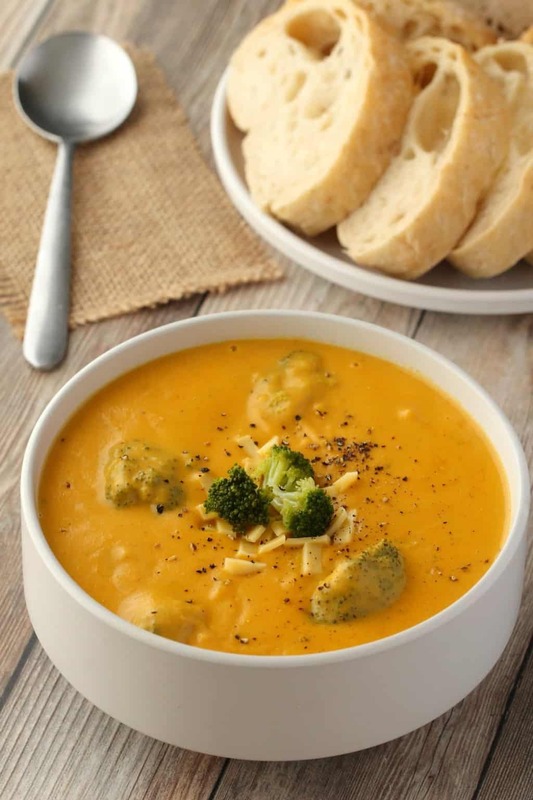 Vegan Broccoli Cheese Soup – Rich and Cheesy! 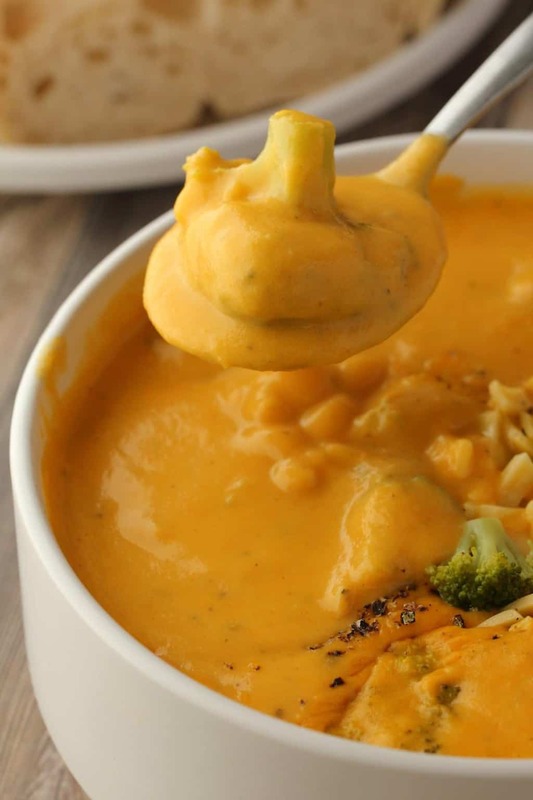 This vegan broccoli cheese soup is so cheesy it’s crazy! Especially considering the fact that it doesn’t have any actual cheese in it. 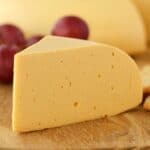 If there was a blind taste test happening I don’t think many people would believe you if you told them that there is no cheese in it, that is how cheesy this is! 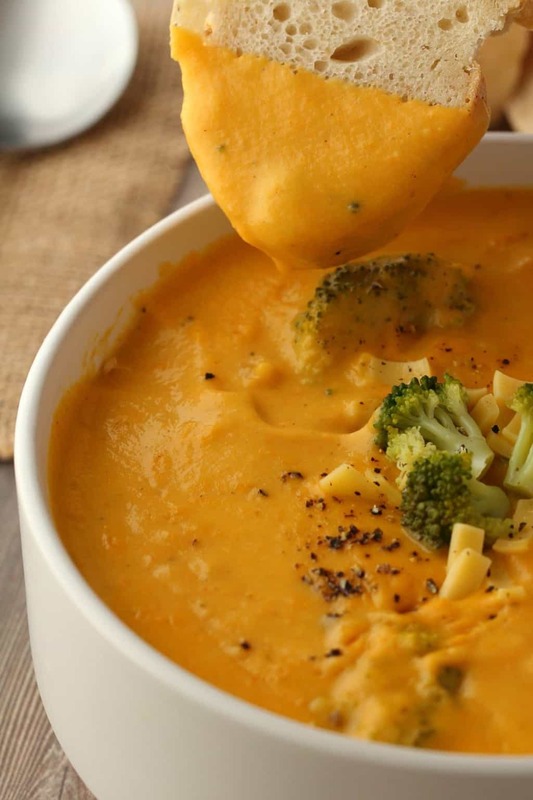 And broccoli and cheesy stuff does go extremely well together. 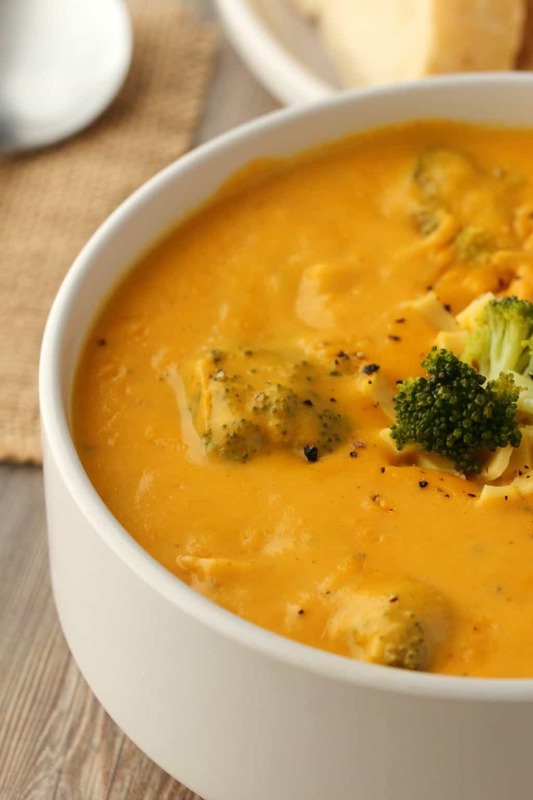 I mean broccoli and cheese sauce – well that goes way back. All the way back to when I was a kid and could not stand green vegetables. I remember one particularly memorable occasion of being made to sit at the dinner table for roughly 5 hours after everyone else had left because I was NOT going to eat that soggy lump of cooked spinach. I was very stubborn. My mom was much more stubborn. I didn’t stand a chance. 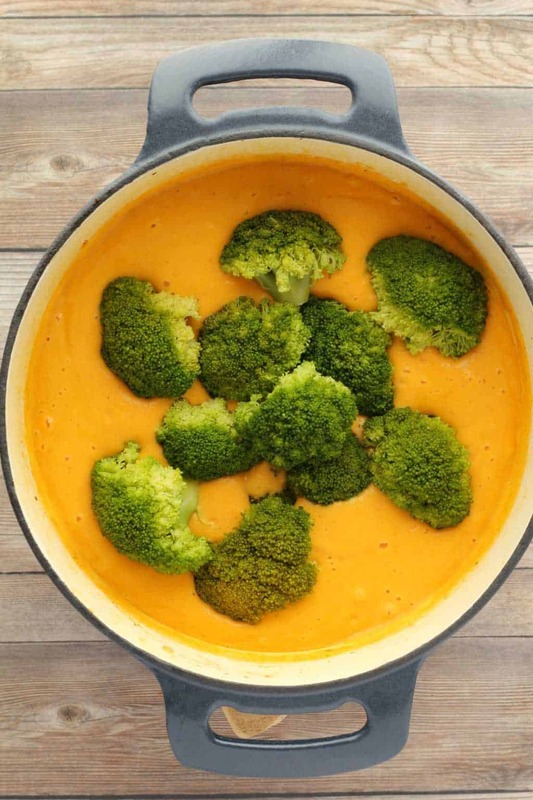 But what I do remember is that if green veggies (broccoli particularly) had cheese sauce on – well then I could quite easily be persuaded to eat them. 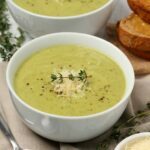 So now, even though we’re all adults and I’m pretty sure we all love the green veg , putting them in some cheesy soup is still a very good idea people! 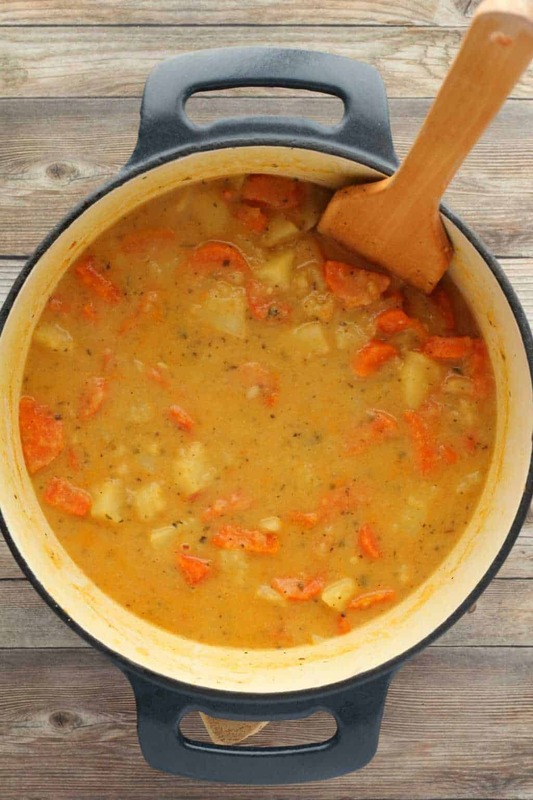 The base of this soup is potatoes and carrots, carrots providing the beautiful color. 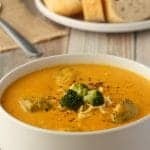 They cook with onions and garlic in some vegetable stock and when nice and cooked are blended with some coconut cream and nutritional yeast and other spices. The textures, the flavors, it’s ridiculous how cheesy this is! 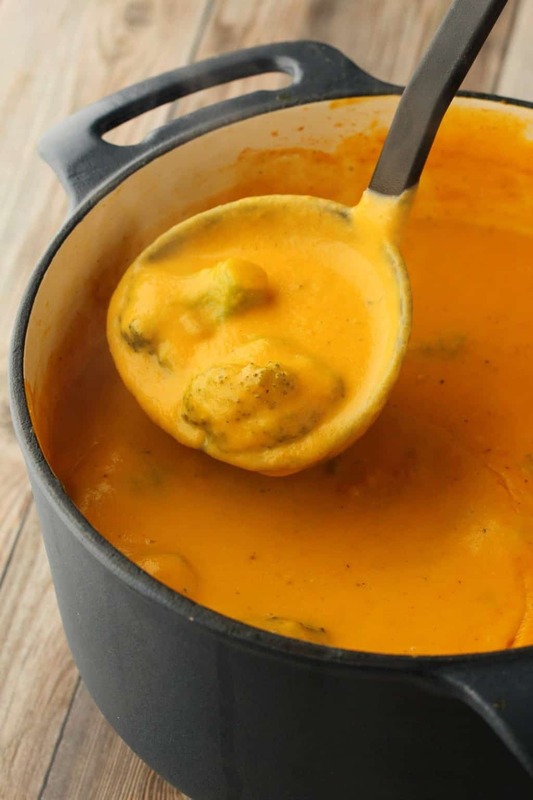 You immersion blend the whole pot (if you have an immersion blender, otherwise you can transfer to your blender jug in stages and then return to the pot), and then you add in your broccoli florets and let them cook in the soup for a few minutes until just tender. 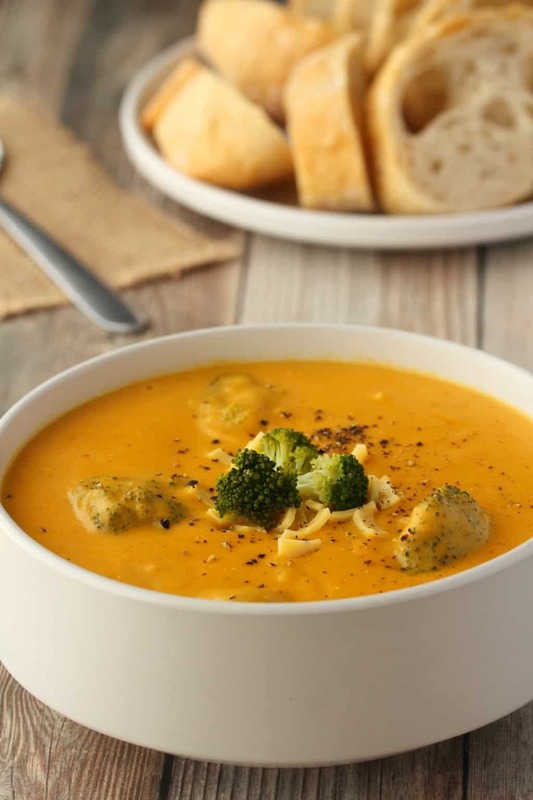 And then you can serve with a tiny bit of vegan cheese on top for decoration (really the only actual ‘cheese’ in the dish) and some black pepper, some bread for dipping (this is a great soup for dipping!) and you have a seriously satisfying meal. 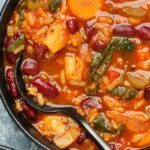 This makes a big pot of soup but leftovers are wonderful reheated the next day so even if you’re only cooking for a couple of people, make the full batch and eat it over a few days, you won’t be sorry you did! 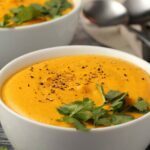 This is great as an appetizer or entrée, but I would probably lean more towards an entrée, even though soups are usually appetizers, this is really hearty and filling, it’s not something you want to have a bowl of and then have something else afterwards. 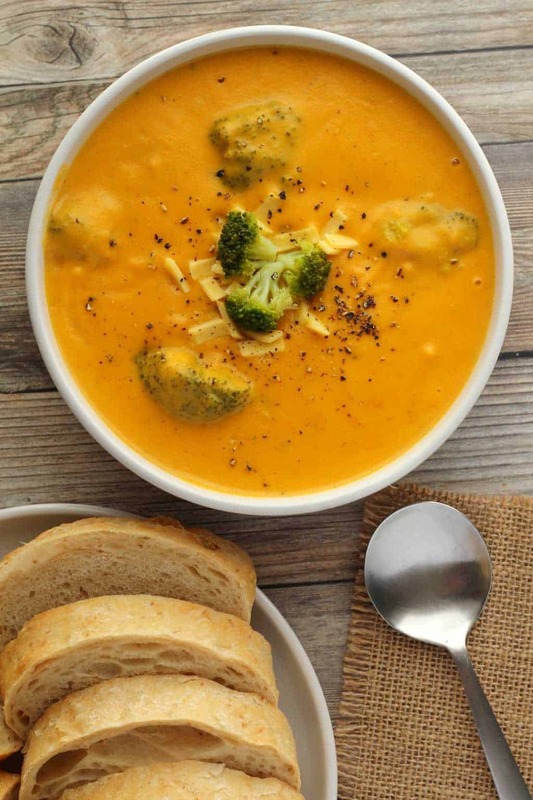 What do you think of this vegan broccoli cheese soup? Let us know in the comments! 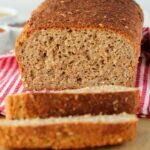 Please rate the recipe too as it’s so helpful, thank you! 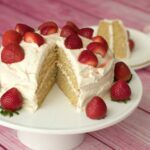 Sign up to our email list while you’re here for an awesome free recipe ebook with 10 gorgeous dinner recipes and to stay updated with all our latest recipes when they’re posted to the blog. 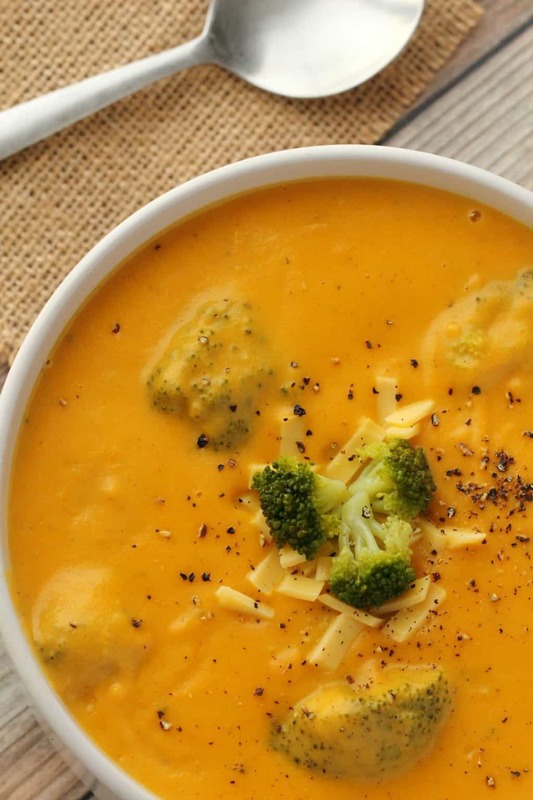 Deliciously cheesy vegan broccoli cheese soup. 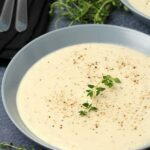 This rich and creamy soup is so satisfying, hearty and comforting with all the cheesy flavor you could dream of! Gluten-Free. Add the chopped onion and crushed garlic to a pot with the olive oil, dried basil and oregano and sauté until softened. Add in the potatoes and carrots and the vegetable stock and bring to the boil. 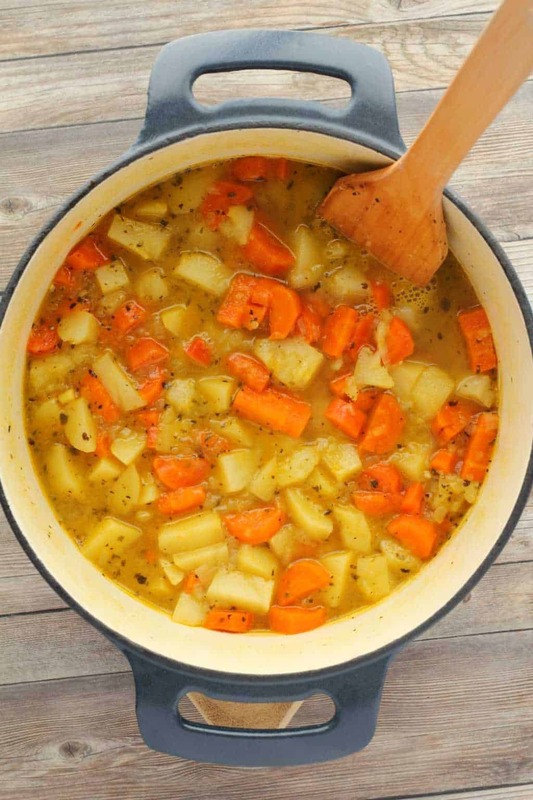 Reduce heat, cover the pot and simmer until the potatoes and carrots are cooked. Then add in the nutritional yeast, onion powder, dijon mustard and paprika and stir in. Add in the coconut cream. Remove the pot from the heat and blend with an immersion blender. If you don’t have an immersion blender, transfer in stages to a blender jug and then return to the pot. Return the pot to the heat. Add in the broccoli florets and cook for a few minutes in the soup until just softened. 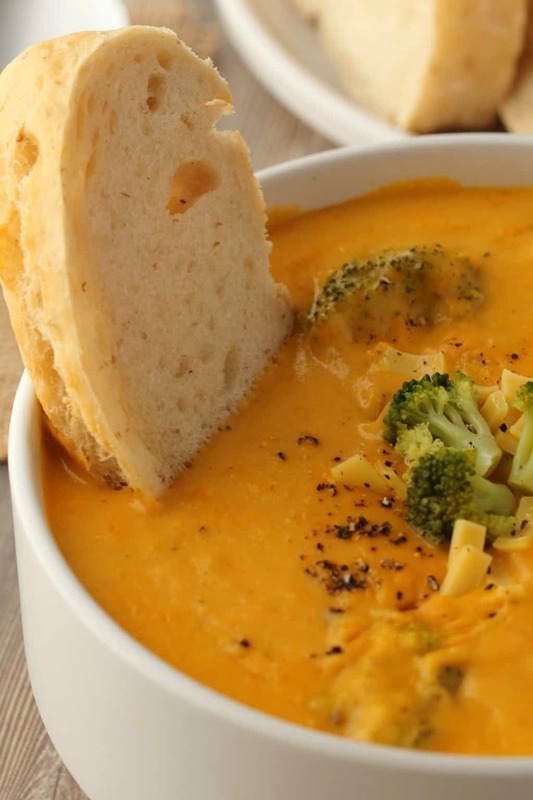 Serve the soup with a little grated vegan cheese (optional) and some black pepper. *Leftovers keep very well and can be reheated the next day. 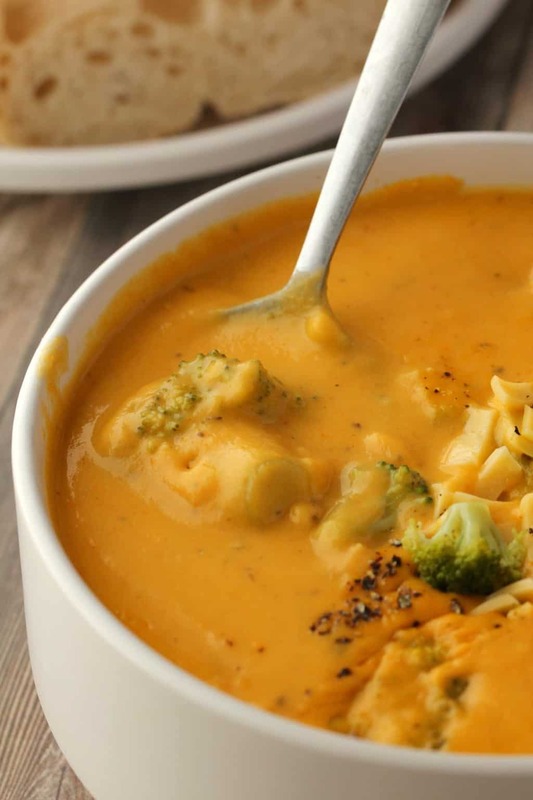 Warm, rich, cheesy amazing soup! 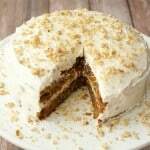 Can you make this without the coconut cream? You could use something else in its place like a different non-dairy cream or non-dairy milk. What can possibly be the substitute for paprika? You can leave it out without it being a big issue. Delicious! Non vegans loved it, also! I made this last night, but I improvised with a bag of frozen sliced carrots and mashed potato flakes. It was divine! I showed it off on Facebook. My immersion blender wasn’t really getting the lumps out so I put it in the blender in 2 stages. Also added about 2 tablespoons of coconut oil after adding the broccoli. The oil gave it a perfectly cheesy gloss and mouth feel. So great! 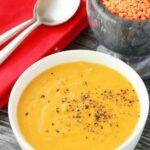 I made sure to link to this recipe for my Facebook vegan friends! I have made this before and my husband (he’s not a vegan) said it was one of the best things I’ve ever made. So thank you Alison! 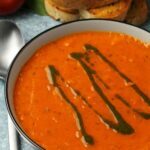 I have added this to my Easter dinner coming up as a starter soup!